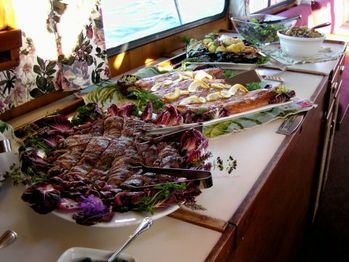 A cruise is an ideal way to entertain clients, host corporate functions and have private events. Enjoy the privacy that this special venue has to offer and an environment that encourages conversation. From casual to formal, the atmosphere is comfortable and relaxing, and it's a nice change of pace from being on land. You are more than welcome to make your own catering arrangements. If you would like us to make arrangements for you, you'll find information from our caterer below. If you prefer, we would be more than happy to have Mangetout contact you, or you may contact them directly for additional menus and pricing. Below is just a very small sample of menu selections. The caterer can put together anything you want, from box lunches to full buffet meals.